Whilst there may be uncertainty in NSW & VIC regards this potential, where lottery agents work under a full franchised system, it is highly unlikely that supermarkets in QLD will get lotteries. 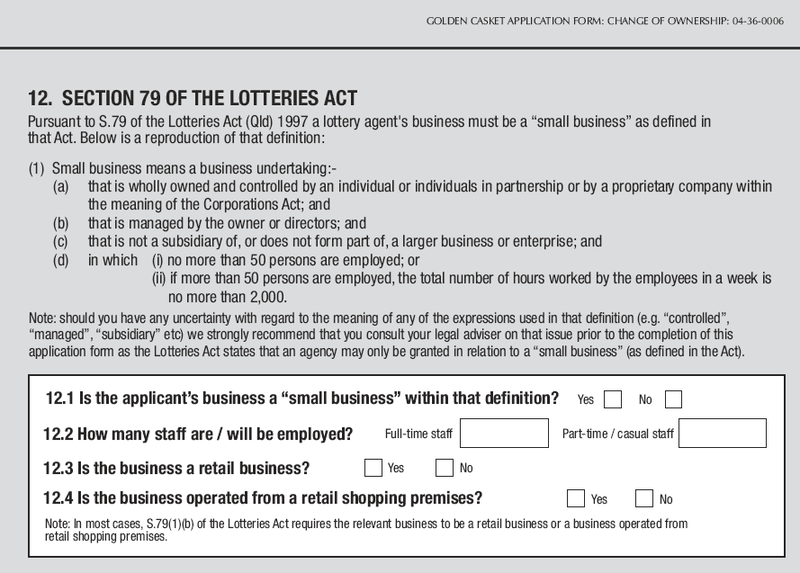 As documented elsewhere, QLD operates under state based legislation “The Lotteries Act 1997”. Below is an excerpt from the Golden Casket transfer of licence application, and as you will see, Tatts highlight the fact that you have to declare to be, by definition, a small business. This precludes any major supermarket from holding a lotteries licence in QLD, hence why QLD Newsagents have always achieved better values and are considered more secure. As widely experienced Specialist Newsagency Brokers, we accept that nothing is impossible, but from our understanding, it would take an act of QLD Parliament, to change this small business protection; so how likely is that ???? Buying a newsagency is all about making an informed judgement. Sometimes you have to piece together facts to get a better understanding.